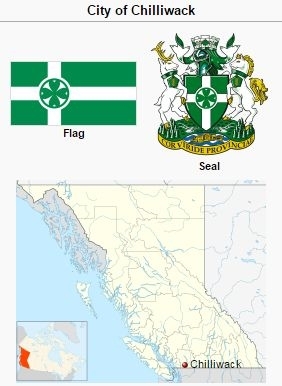 Flag, Emblem, and Map of Chilliwack. Chilliwack is a city located in the eastern Fraser Valley of British Columbia, Canada (coordinates: [49.17102, -121.95258 [49° 10′ 15″ N, 121° 57′ 9″ W]). It is situated 25 km (15.7 miles) east of Abbotsford and 100 km (62 miles) east of Vancouver. The city is surrounded by tall mountain peaks and several rivers. Its mild climate provides excellent growing conditions for a wide variety of agricultural products. In 2011 the city had a population of 77,936. In 2006, 90.6% of the City’s population was White, 4.9% were Aboriginal, including First Nations and Métis, and 4.5% were a wide variety of visible minorities. In 2011, 86.6% of the population reported English only as their mother tongue, 1.3% reported French only, and 11.1% reported a non-official language only (including German, 3.4%, Dutch, 2.2%, and Spanish 0.7%). The Township of Chilliwhack (the Township spelled their name with an “h”) was incorporated in 1873 – the third oldest municipality in British Columbia. The City of Chilliwack was incorporated in 1908. The two merged in 1980 to form the District of Chilliwack and became the City of Chilliwack in 1999. The City includes a number of villages and communities. The original city, “Chilliwack Proper,” is located north of the Trans-Canada Highway; other communities north of the Highway include Fairfield Island, Camp River, East Chilliwack, Rosedale, and Popkum. Communities south of the Highway include Sardis, Vedder Crossing, Greendale, Yarrow, Ryder Lake, Atchelitz, Cultus Lake, and Columbia Valley. Archeological records indicate that Aboriginal peoples were present in Chilliwack and the surrounding Fraser Valley as far back as 10,000 years. It is estimated that the Stó:lō population was between 40,000 and 60,000 people when European settlers first arrived in the area, beginning in 1782. Diseases introduced by the European settlers, such as small pox, reduced the Aboriginal population by 90-95%. Indian Reserves were first established by Sir James Douglas, Governor of the Colony of British Columbia, in the 1850s. In 2014, Chilliwack included over a dozen Indian Reserves. East Chilliwack was first settled in 1869-70. In the early years, the area often flooded in the spring, caused by the flow of water from the surrounding mountains. Ditches were constructed after 1900 to help alleviate the problem. Cedar and fir trees, often 3-3.6 meters (10-12 feet) in diameter, were logged and stumps were cleared, allowing for farming to take place. By 1920, most of the valley floor and some of the hillside areas had been cleared of forests. Mennonites began to settle in the area in 1940, when the William and Margaret Wiebe family, originally from southern Manitoba, relocated to the area from Black Creek on Vancouver Island. A number of Mennonite families, mostly from the Canadian Prairie provinces, began relocating to East Chilliwack in 1943. Most of these settlers had suffered severe crop failures during the 1930s, and were looking for a stable agricultural environment and a more moderate climate. Unlike the communities of Yarrow and Greendale, Mennonites purchased existing dairy farms in East Chilliwack and settled throughout the area amongst non-Mennonite settlers. The Mennonite Brethren families in the area began organizational meetings in the summer of 1944, and a small hall on McGrath Road was rented until a church building could be constructed. The East Chilliwack MB Church formally organized on 6 January 1945 and dedicated their new building at that time. Several months later, in April 1945, General Conference Mennonite families met to discuss the possibility of forming a congregation, and in July of that year they gathered in a rented school for their first service. On 28 December 1945, 32 members formally organized the Westheimer Mennoniten Gemeinde (later East Chilliwack Mennonite Church, now Eden Mennonite Church). The steady movement of Mennonite families from the Prairie Provinces continued throughout 1945-46, and in May 1947, 66 families left the East Chilliwack MB congregation to form Chilliwack (now Broadway) MB Church in the city. That same month, a group within the Westheimer congregation left to form the First Mennonite Church on Wellington Avenue in the city. Their departure was due to theological differences within the congregation. By May 1947, Chilliwack had four Mennonite and Mennonite Brethren congregations. October 1947 saw the start of the East Chilliwack MB Bible School with 56 students. The school lasted until 1959. In the early years, the vast majority of Mennonite families were mixed farmers. The high demand from the British Commonwealth for fruit, World War II federal regulatory price and supply controls, and an ideal climate created favorable conditions for the expanding of dairy operations to include the growing of raspberries and strawberries. Incomes were further bolstered by adding poultry and hog raising operations. In 1947, 23 Mennonite farmers in East Chilliwack formed the East Chilliwack Fruit Growers Co-operative Association to market their berry crops. The Co-op eventually added a feed production division and expanded their services by forming the East Chilliwack Credit Union (now Envision Financial Credit Union) in 1954. For many years, Mennonites played a dominant role in the ownership and management of both the Co-op and the Credit Union. A fifth Mennonite congregation was formed in Chilliwack in 1956, when the Chilliwack Fellowship Church, an Evangelical Mennonite Brethren congregation, was planted in the city. The church remained small and dissolved in 1969. In the 1960s and early 1970s, English became the primary language of worship in the Mennonite congregations in Chilliwack. In 1959 a group wanting to worship in the English language in the First Mennonite congregation began their own church, the Chilliwack Mennonite Mission Church. The church dissolved in 1969, with most members returning to the mother congregation or to Eden Mennonite. Increased urbanization amongst Mennonites in Chilliwack in the 1960s and 1970s saw the planting of Sardis Community Church in 1975 and the relocation of East Chilliwack MB Church to the city in 1981, with a change in name to Central Community Church. Crossroads Community Church was planted in Sardis by the Conference of Mennonites in BC in 1994, Peace Community Church was planted as a daughter congregation of Crossroads in 1998 (closed in 2000), and Promontory Community Church was planted by the BC Conference of MB Churches in Sardis in 2000. Recent developments include the planting in 2008 of the Rosedale Mennonite Church (initially known as the Chilliwack Mennonite Church) by the Eastern Pennsylvania Mennonite Church, the establishment in the same year of Ministerio Cristiano Broadway, a Spanish-language congregation, and the launch in 2011 by Promontory Community Church of a second campus in downtown Chilliwack. By 2014 this would become the sole location for the church, renamed Main Street Church. See also articles dealing with the communities of Greendale and Yarrow. Nachtigal, George. The History of Eden Mennonite Church, Chilliwack, British Columbia: 1945-1995. Chilliwack, BC: Eden Mennonite Church, 1995. Penner, Peter H. East Chilliwack Mennonite Brethren Church, British Columbia: 25th Anniversary 1945-1970. Chilliwack, BC: East Chilliwack MB Church, 1970. Thiessen, Richard D. "Chilliwack (British Columbia, Canada)." Global Anabaptist Mennonite Encyclopedia Online. November 2014. Web. 21 Apr 2019. http://gameo.org/index.php?title=Chilliwack_(British_Columbia,_Canada)&oldid=132499. Thiessen, Richard D. (November 2014). Chilliwack (British Columbia, Canada). Global Anabaptist Mennonite Encyclopedia Online. Retrieved 21 April 2019, from http://gameo.org/index.php?title=Chilliwack_(British_Columbia,_Canada)&oldid=132499. This page was last modified on 30 July 2015, at 07:33.